Cementitious-based coatings are among the oldest products used for above-grade water-proofing applications. Their successful use continues today, even with the numerous clear and elastomeric sealers available. However, cementitious systems have several disadvantages, including an inability to bridge cracks that develop in substrates after application. 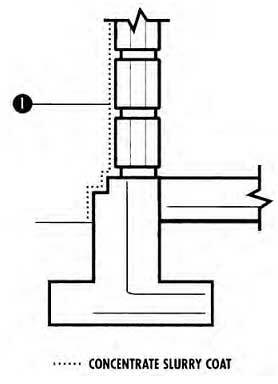 This can be nullified by installation of control or expansion joints to allow for movement. In remedial applications where all settlement cracks and shrinkage cracks have already developed, only expansion joints for thermal movement need be addressed. These coatings are cement-based products containing finely graded siliceous aggregates that are nonmetallic. Pigments are added for color; proprietary chemicals are added for integral waterproofing or water repellency. An integral bonding agent is added to the dry mix, or a separate bonding agent liquid is provided to add to the dry packaged material during mixing. The cementitious composition allows use in both above- and below-grade applications. See Fig. 3.7, for a typical above-grade cementitious application. 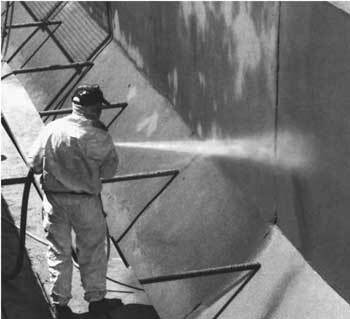 FIGURE 3.7 Spray application of cementitious waterproofing. Since these products are water-resistant, they are highly resistant to freeze–thaw cycles; they eliminate water penetration that might freeze and cause spalling. Cementitious coatings have excellent color retention and become part of the substrate. They are also non- chalking in nature. Color selections, such as white, that require the used of white Portland cement, increase material cost. Being cementitious, the product requires job-site mixing, which should be carefully monitored to ensure proper in-place performance characteristics of coatings. Also, different mixing quotients will affect the dried finish coloring, and if each batch is not mixed uniformly, different finish colors will occur. Cementitious coatings have excellent compressive strength, ranging from 4000 to 6000 lb/in2 after curing (when tested according to ASTM C-109). Water absorption rates of cementitious materials are usually slightly higher than elastomeric coatings. Rates are acceptable for water- proofing, and range from 3 to 5 percent maximum water absorption by weight (ASTM C-67). Cementitious coatings are highly resistant to accelerated weathering, as well as being salt-resistant. However, acid rain (sulfate contamination) will deteriorate cementitious coatings as it does other masonry products. Cementitious coatings are breathable, allowing transmission of negative water vapor. This avoids the need for completing drying of substrates before application, and the spalling that is caused by entrapped moisture. These products are suitable for the exterior of planters, undersides of balconies, and walkways, where negative vapor transmission is likely to occur. Cementitious coatings are also widely used on bridges and roads, to protect exposed concrete from road salts, which can damage reinforcing steel by chloride attack. Water entering masonry substrates causes brick to swell, which applies pressure to adjacent mortar joints. The cycle of swelling when wet, and relaxing when dry, causes mortar joint deterioration. Cementitious coating application prevents water infiltration and the resulting deterioration. However, coatings alter the original facade aesthetics, and a building owner or architect may deem them not acceptable. Cementitious coatings are only used on masonry or concrete substrates, unlike elas- tomeric coatings that are also used on wood and metal substrates. Cementitious coating use includes applications to poured-in-place concrete, precast concrete, concrete block units, brick, stucco, and cement plaster substrates (Fig. 3.8). Once applied, cementitious coatings bond so well to a substrate that they are considered an integral part of the substrate rather than a film protection such as an elastomeric coating. 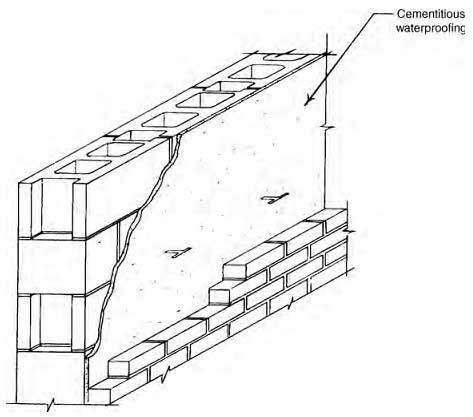 FIGURE 3.8 Block cavity wall waterproofing using cementitious waterproofing. Typical applications besides above-grade walls include swimming pools, tunnels, retention ponds, and planters (Fig. 3.9). With Environmental Protection Agency (EPA) approval, these products may be used in water reservoirs and water treatment plants. Cementitious coatings are often used for finishing concrete, while at the same time providing a uniform substrate coloring. 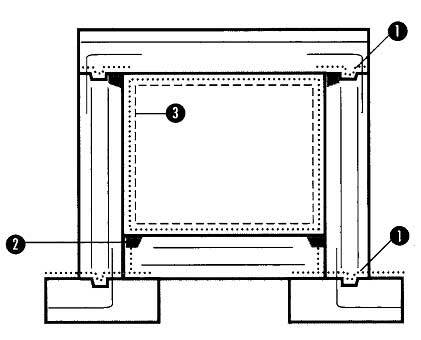 FIGURE 3.9 Typical detailing of tunnel waterproofing applicable to above-grade applications. An advantage with brick or block wall applications is that these substrates do not nec- essarily have to be tuck-pointed before cementitious coating application. Cementitious coatings will fill the voids, fissures, and honeycombs of concrete and masonry surfaces, effectively waterproofing a substrate (Fig. 3.10). When conditions require, complete coverage of the substrate by a process called bag, or face, grouting of the masonry is used as an alternative. In this process, a cementitious coating is brush applied to the entire masonry wall. At an appropriate time, the cementi-tious coating is removed with brushes or burlap bags, again revealing the brick and mortar joints. The only coating material left is that in the voids and fissures of masonry units and mortar joints. Although costly, this is an extremely effective means of waterproofing a substrate, more effective only than tuck-pointing. Complete cementitious applications provide a highly impermeable surface and are used to repair masonry walls that have been sandblasted to remove existing coatings and walls that are severely deteriorated. Cementitious applications effectively preserve a facade while making it watertight. Bag grouting application adds only a uniformity to substrate color; colored cementitious products can impart a different color to existing walls if desired. Mask grouting is similar to bag grouting. With mask grouting applications, existing masonry units are carefully taped over, exposing only mortar joints. The coating material is brush-applied to exposed joints, then cured. Tape is then removed from the masonry units, leaving behind a repaired joint surface with no change in wall facade color. The thickness of coating added to mortar joints is variable but is greater when joints are recessed. This system is applicable only to substrates in which the masonry units themselves, such as brick, are nondeteriorated and watertight, requiring no restoration. Texture is easily added to a cementitious coating, either by coarseness of aggregate added to the original mix or by application methods. The same cementitious mix applied by roller, brush, spray, hopper gun, sponge, or trowel results in many different texture finishes. This provides an owner or designer with many texture selections while maintaining adequate waterproofing characteristics. A summary of the major advantages and disadvantages of cementitious coatings are given in Table 3.12. In certain instances, such as floor–wall junctions, it is desirable first to apply the cementitious coating to a substrate, and then to fill the joint with sealant material in a color that matches the cementitious coating. The coating will fully adhere to the substrate and is com-patible with sealant materials. It is also possible first to apply cementitious coating to sub- strates, then to apply a sealant to expansion joints, door, and window penetrations, and other joints. This is not possible with clear sealers nor recommended with elastomeric coatings, due to bonding problems. Cementitious coatings are a better choice over certain substrates, particularly concrete or masonry, than clear sealers or elastomeric coatings. This is because cementitious coat- ings have better bonding strength, a longer life cycle, lower maintenance, and less attrac- tion of airborne contaminants. Provided that adequate means are incorporated for thermal and structural movement, cementitious coatings will function satisfactorily for above-and below-grade waterproofing applications.